Dogs Trust is organizing a competition for elementary school of the Canton in cooperation with the Ministry of Education, Science and Youth of Canton Sarajevo, with the aim to evaluate the knowledge adopted at the fun-educational workshops that the Foundation carries out in schools of this canton for full three years. A briefing by the Minister of Education, Science and Youth of Canton Sarajevo, Elvir Kazazović, and the Head of Dogs Trust Representative Office in B-H, Anel Becirovic on the occasion of the start of the competition took place on 16th December, 2015. “Knowledge is power, and the best way to ensure a better future for our children is to help them grow up safe and become responsible citizens.” Said Minister Kazazović, adding that the Ministry supports Dogs Trust’s contribution in this, but also all the other projects that are of the interest of the community, particularly its youngest members, and that in this sense, this cooperation will continue. The schools will assign competition teams on municipal and cantonal levels, and their tasks will be to produce a video on one of the following topics: “Safety around dogs “,” Responsible Dog Ownership “and” Needs of dogs as living beings.” Videos can be in the form of debates, plays, songs, recitations and similar. 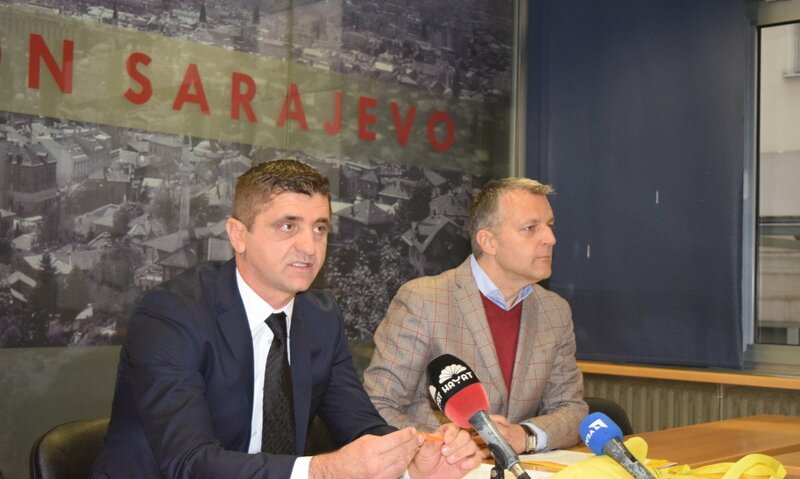 “We would like to express great satisfaction with the excellent cooperation with the vast majority of schools and parents in Canton Sarajevo, which is why we came up with the idea to reward them for such great work that through a fun knowledge assessment and to give them valuable prizes,” Becirovic said. He especially emphasized the excellent cooperation with the Ministry, and thankedit for the continued support to the Foundation’s education programme. Prizes for the cantonal level of competition include equipping a multimedia classroom as the first prize, a computer and a camcorder as the second prize, and the computer and camera for third prize. All municipal winners will each receive a camera, while all the competition team members will be awarded a trip to the Nature School in Šabići where they will be greeted with a special program. Or via e-mail at: office@dogstrust.ba. The winning teams of the municipal level will be announced at the end of February 2016, while the announcement of the cantonal cantonal level winners and the Awards ceremony will take place at end of May 2016. All schools will be informed about exact dates. Dogs Trust is expanding its programmes to other parts of the country; the education programme started in Canton 10 at the beginning of 2014/2015 school year, and in in Banja Luka and Zvornik region, this school year, where the children will have the opportunity to have fun and learn about the most important security aspects when it comes to dogs, as well as the responsible dog ownership. The events promoting this programme that included a demonstration workshop and sharing of symbolic gifts and promotional materials, took place in Banja Luka on 4th of December and in Zvornik on 12th od December 2015.